We were in India for one month (December 5th – January 5th 2010). A full gallery of photo’s is up on flickr. The rough route we took is mapped here. The plane kissed the patchwork of slum houses on it’s descent into Mumbai airport. At 2am it was warm but not too humid – it was winter. Restrained behind a courtyard barrier stood the chaotic energy of India. Fortunately we quickly found our friend, who found their driver soon after – and our comfortable guided introduction to Mumbai began. In the 20 minute drive to our accommodation you could see the city never slept. Families out walking with kids, crowds preparing for religious festivals, people loitering or sleeping anywhere and everywhere. It was remarked that in India you never feel alone – there is always someone around. In Mumbai we got to see the touristic haunts: Gateway of India, Taj hotel, Leopolds bar/cafe (complete with framed bullet holes from the Mumbai terrorist attck 1 year earlier). Fortunately as we were staying with some local Mumbaikers, we saw some less touristic areas: the Haj Ali mosque from a distance, the causeway to and coctails of Bandra, coctails on top of the intercontinental, and the elite Breach Candy swimming club.We also got quickly shown the consumer institutions FabIndia and Bombay Store. Personal highlights of our time in Mumbai was eating Gujarati food at Swati Snacks, and taking a 2 hour walking history tour which was fascinating. There were so many impressions: the clawing heat, the street coal sellers; porters wheeling carts through hectic streets; streetside chai wallahs; life lived in every spare metre; hawkers and invalids taping on the car window for change; taxi drivers in old yellow topped cabs; the cute Indian ‘head wobble’; parsi and Zoroastrian influences and the frequent lime soda (sweet salty). After a few days in Mumbai – we arrived pre-dawn at the always hectic train station – to find our pre-booked seats on the train south to Goa. With frequent 10c cups of chai, and less frequent 10c cups of nescafé, we slowly trundled along in our peaceful 1st class carriage. As we took our pre-paid cab to our guest house in Baga beach – we were struck by how built up with package tourists and resorts Goa was. Fortunately our accommodation was tucked away off the main strip. A clean, quiet and secluded haven from the busy streets, Russian package tourists and streetside hawkers. A twenty minute drive away from Baga beach was the Portugese influences in Panjim (the capital) and Old Goa. Grand old churches, stone buildings and the brightly coloured Old Latin Quarter. Despite having to quell waves of nausea I enjoyed Goa. It was over developed, and full of western and domestic tourists, but we saw glimpses of its beauty. The logistics of getting further south were difficult – we were forced to book an evening sleeper carriage berth out of Goa to Mangalore. Arriving early we pressed our way onto the carriage following the natural hustle. Once inside – the contrast to the more austere first class carriage was apparent. People draped from every seat and nothing was stationary for long. 6 hours flew by – with constant colour and excitement (and for Denise a bit too much earnest staring). We arrived late into Mangalore – for an overnight rest before a bumpy 5 hour drive through endless potholes into the Western Ghats. We had booked into Rainforest Retreat – an ‘eco-chic’, organic farm (vanilla, coffee, cardamon) and bio-diversity hot spot. It was an interesting place, with interesting guests, and most importantly superb shade-grown coffee (a rarity given nescafé was served even in upmarket hotels) and food. Our days were spent spotting wildlife, reading, hiking and lying in hammocks. 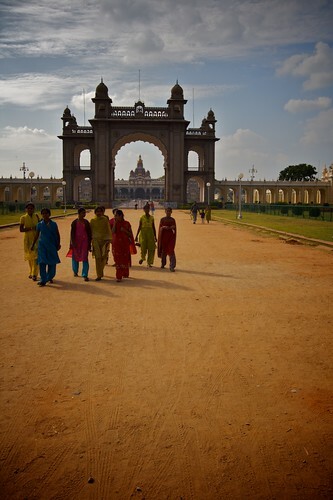 Mysore is a busy market town and was our next destination after the tranquility of Rainforest Retreat. We decided to stay in a crisp, TATA owned business hotel partly due to wifi internet access and the simplicity of a late online reservation. The services of a tuktuk driver were enlisted on our first day in Mysore to guide us around. Slowly he forced his 2 stroke engine up Chamudi Hill – where busloads of domestic tourists piled through Chamundeswari Temple – but we just marveled at the temple,and statues. On our return we bought some beautiful silk gifts at a Government authorised textile store. 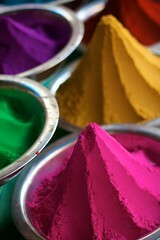 At my behest, we were shown around some markets as I was hoping to catch sight of the bright colours. Unfortunately it turned into a ruse as we were shown into a traders incense and perfumery store – and co-opted into buying a stupid amount of sandalwood incense. After this – we got our driver to take us to the main markets, where I got my sought after images. We then left our driver whilst we grabbed our lunch (a thali) before getting dropped of outside the Mysore palace. The palace was beautiful – both inside and out. Unfortunately cameras were not allowed inside. Twice weekly they light up the palace at night and a throng of local and tourists descend. I liked Mysore – there were so many workshops and stores where as you passed by you’d catch fascinating glimpses of others lives. 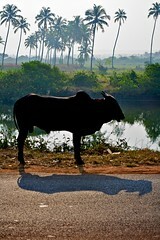 Our driver from Mysore was gentle behind the wheel – a rare trait. It was amusing as we drove back into the Western Ghats watching people flinging their grains across the road – allowing the semi-regular traffic to do the back breaking milling. It was equally amusing watching our driver studiously try to avoid the litter. Arriving at the Edakkal caves – we had a nervous moment as the road turned ever steeper and the throngs of domestic tourists continued to try and dissuade our driver from continuing up. With some wheel spins, and gentle persuasion we arrived at the Edakkal Hermitage. As with many of the places we stayed at – all meals were included – and all the meals served were plentiful and most delicious. Soon after our arrival we were ushered up to the alfresco dining area – where we were momentarily stunned as a rifle was retrieved to scare away the ever pesky monkeys. Later for dinner on our first night – we were invited to dine alone in a romantic cave lit by candles! The Edakkal caves themselves were worth a look with neolithic carvings of geometric shapes nestled behind moss and lichen. On our second day in the Eddakal Caves area we got up pre-dawn to go on a jeep safari through the nature reserve. Crammed in a noisy diesel jeep – rangers drove mostly local tourists through the park – quickly pointing out glimpses of deer and wild elephants. Occasionally we would bypass a good view of a pack of elephants as the driver and guide got too nervous of being charged. 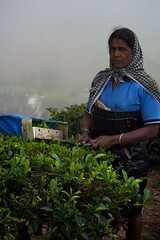 Munnar is famed for it’s rolling hills with mazes of tea planted, tended and picked. All the tea is owned by the Tata tea company – the worlds second largest Tea company (owns Tetleys) – and Munnar was indeed very picturesque once we got outside of the uninspiring town. Venturing out for dinner on our first evening we happened upon Ramaraj, a local rickshaw driver, who inspired us to hire him for the coming day for a tour. This turned out to be a great decision – as Ramaraj was friendly and personable and over the coming two days made our time in Munnar very memorable. On that first day we were slowly driven out of town to go boating on a lake, head to the (clouded over) Top Station, view Mattupetty Dam, visit the Tata Tea Museum and book in for an evening Kathakali show. It was Christmas eve – and as we walked back to our hotel that afternoon we decided to investigate the nearby drumming sounds. Soon we’d stumbled upon a festival procession – complete with drummers, and a procession of colourfully clothed women with what seemed like pot plants on their heads. This was the colour and character of India which you can’t escape. 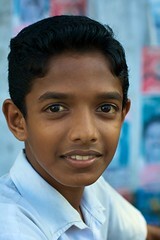 For Christmas day Ramaraj had offered to take us hiking – starting before sunrise. In the cold pre-dawn hill station air – we rattled along in Ramaraj’s rickshaw until we reached the base of ‘his’ mountain. It was a steep scramble to the top – but it was a stunning view. The music blaring from temples throughout the valleys had continued overnight and throughout our walk – giving us a uniquely Indian soundtrack to our hike. To top it all off Ramaraj went to the Government store to buy me a few Kingfishers for a Christmas treat. Alleppey is described as the Venice of the East – with a series of villages accessed via the backwaters. We found Alleppey to be one of the most friendly towns – with most of the tourists out on the water in converted rice barges (kettavelum). We stayed two nights outside of Alleppey proper at Puzhayoram heritage hotel in Kumarakom. The rooms and attention to detail of this hotel were superb – and they offered the best malai kofta I’ve ever had – however it was isolated and expensive. Leaving Kumarakom – we took a local ferry, which cost next to nothing, to Alleppey. The 4 hours or so punting up the backwaters and stopping into all the villages accessible only by water was a brilliant way to travel. We spent our first night at Motty’s homestay, eating lovely food and chatting with other guests and Motty himself. Wandering around on our first day in town we became instant celebrities as school was let out – and kids got to wave and practice their English, whilst I practiced my portrait photography! We moved on the next day to Raheem residency – as it was our ‘anniversary’ and an excuse to spoil ourselves. Unfortunately due to a strike called by one of the political parties – we couldn’t head out on the backwaters or hire a taxi – so were forced to walk the few kilometers to our hotel. Easier said than done, and when a wheel on our suitcase broke we were lucky a good samaritan stopped by and gave us and our luggage a lift on his scooter. Later that night we took part in a beach festival – flying small kites as the sun set over the ocean, watching the parade of popcorn, icecream and kite sellers. Even later that night – we cursed spending so much for an expensive hotel right beside a beach party that carried on into the wee hours. Leaving Alleppey we hired an iconic Ambassador car and driver for the short trip to Fort Kochi (Cochin). 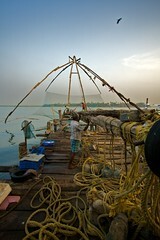 Fort Kochi is famed for its Chinese fishing nets – although they are now used more for tourist dollars. 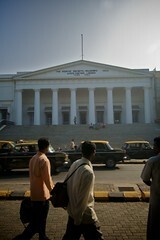 Cochin was a bit of a shock – as aside from Goa it was the first place we’d been to with a mob of western tourists. It was an interesting place with some great cafes, restaurants and galleries. We stayed at a nice home-stay, took an interesting walk around Jew town and bought up big at hidesign. We spent New Years eve in Cochin. It was interesting to see – as kids would build Santa Clause effigies, and the town would create one large effigy which got burnt at midnight, with a backdrop of fireworks. New years day brought the famous Cochin parade – suffice to say it was the strangest parade I’ve seen. Floats that were as cheap as they were amusing, participants in various costumes, dancers and crowds ten people thick craning to watch the slow procession. Leaving Cochin – we flew back for a few days in Mumbai before jetting further afield into the deep frost of England.